Regional symbol of Tabanan has pentagon shaped with edge line symbolizes Pancasila (the official philosophical foundation of the Indonesian state) as the basis of the philosophy of the Republic of Indonesia which is always held in high esteem and always illuminate the soul of its people. Inside that pentagon shaped there are some symbols like Mount Batukaru with black color symbolizes of wealth and strength of the people of Tabanan in the spirit of dynamic ambition toward a fair and prosperous society. Temple (Monument) with white color symbolizes heroism of the people of Tabanan in defending the sovereignty and independence of Indonesia. Rice and Cotton (rice is on the left side with yellow color and cotton is on the right side with white color) symbolizes food and clothing which became the basic needs of daily, 20 grains of rice and 11 pieces of cotton symbolizes Puputan Margarana war on 20 November 1946 against the Dutch colonial in Tabanan. There is also the word "Tabanan" which means the regency of Tabanan itself, and there is a motto "Sadhu Mawang Anuraga" means faithful and wise to run the truth for love to the people. 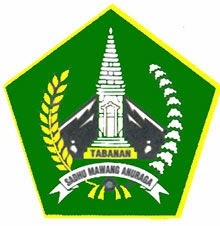 The regional symbol of Tabanan has 4 colors, those colors are black which is mean majesty, yellow means nobleness, light green means purity, and white means holiness. Tabanan regency geographically is located between 114° – 54’ 52” east longitude and 8° 14’ 30” – 8° 30’07” south latitude. The topography of Tabanan regency is located at an altitude 0 – 2.276 m above sea level with details on altitude 0-500 m above sea level is a flat region with a slope of 2-15%, and at an altitude of 500-1000 m above sea level is flat to sloping areas with a slope of 15-40%. In areas that have a slope of 2-15% and 15-40% is a pretty fertile area where farmers undertake farming activities to make ends meet. In areas that have a height of over 1,000 m above sea level and with a slope of 40% and above is a hilly area and steep, a total of 23,358 hectares or 28.00% of the land area in the district of Tabanan is the rice fields, so that Tabanan is known as an agricultural area. The boundaries of the regency of Tabanan are: in the north bordering with Buleleng regency which is bordered by the mountain range like Mount Batukaru (2,276 m), Mount Sanghyang (2,087 m), Mount Pohen (2,089 m), in the east bordering with Badung regency which is bordered by Yeh Sungi river, Yeh Ukun river and Yeh Penet river. In the south it's bordered by Indian ocean with a width of the beach approximately 37 km, in the west bordering with Jembrana regency which is bordered by Yeh Let river. 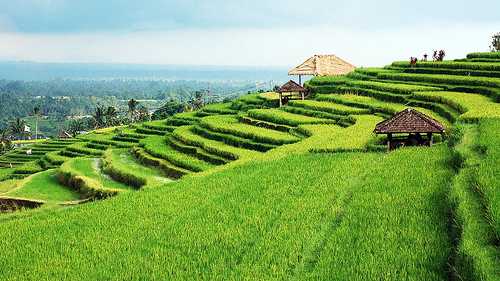 Tabanan is one of the most popular tourist destination in Bali, There are many places of interest that can be visited in Tabanan, and also there are many hotels, restaurants, villas and other accommodation that fit perfectly used as a family holiday or just simply as a refreshing place. Below are some of the best tourist destinations in Tabanan regency.